Forrás: The National. Szerző: Salam Al Amir. Beauty salons will face a Dh2,000 fine for using black henna, the Dubai Municipality announced. Delores Johnson / The National. Beauty centres in Dubai that use black henna will be fined, and face closure if the offence is repeated, Dubai Municipality said on Friday. The municipality warned beauty centres against the use of black henna and has set a fine of Dh2,000 if the banned product is used for the first time. Should the offence be repeated, the salon will be shut down for a period to be determined by the municipality. 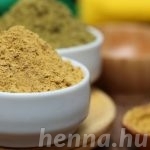 Black henna is banned due to the chemicals it contains, which cause skin burns. Sign boards have been fixed in all salons and beauty centres warning customers about the consequences of black henna. They also warn beauty shop workers against giving in to any pressure by employers. Due to the increase in demand for services at beauty centres, especially the use henna, during Eid Al Adha, the municipality assigned a team to supervise services and cosmetic products used by salon staff. In its warning, the authority said that any quantity of black henna or unauthorised mixtures found in salons will be seized and destroyed. The municipality appealed to customers to cooperate in reporting offences through its emergency centre, which operates around the clock, by calling 800900.